Manchester Friends of the Earth | News release: Get animated about air pollution! News release: Get animated about air pollution! 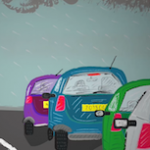 Today, Tuesday 14th August, Manchester Friends of the Earth are launching a powerful animation to highlight the damage caused by air pollution in Greater Manchester. Manchester Friends of the Earth response to DEFRA Clean Air Strategy consultation. See GM Combined Authority website. DEFRA draft Clean Air Strategy consultation.